Imagine waking up, filling the Jacuzzi tub up with hot water and soaking up the beautiful sounds of the Gulf of Mexico. 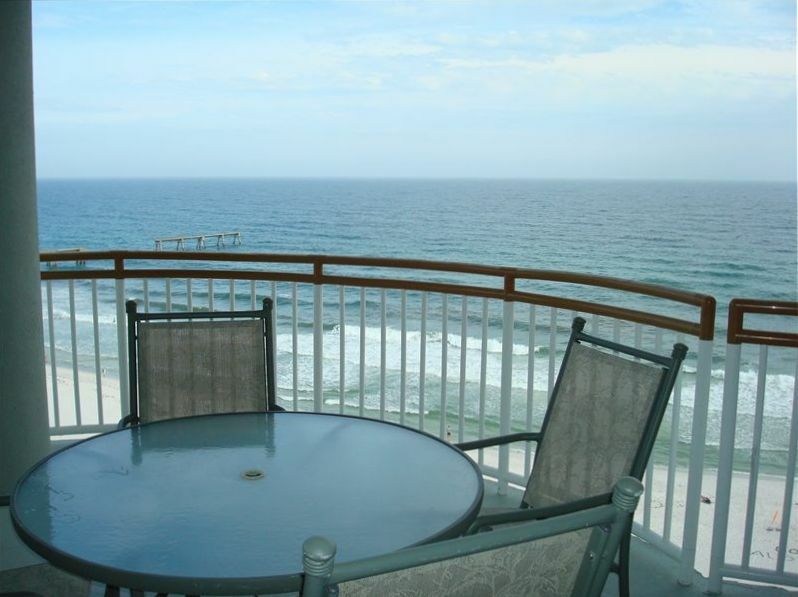 The unit has 2 bedrooms and 2 baths and is a part of the magnificent Beach Colony Complex. Each floor is private and keeps unwanted guests from being able to access your area. We have 2 beach chairs and an umbrella on the beach included in the rental. As mentioned before this Condo sits right on the Beach. The beach has luxurious white smooth sand and clear emerald blue water. The area is perfectly populated, not like many overcrowded vacation spots. The amenities of the condo are listed below. Some worth noting though are the fully equipped kitchen, Jacuzzi tub, tile showers, washer, dryer and an amazing spacious wrap around balcony that connects to the master bedroom. The floor plan is great. A breakfast nook, dining room and living area flow perfectly. The master bedroom has a king size bed, TV, walk in closet, shower, and Jacuzzi tub. The other bedroom hosts two double beds, one large closet, a couple dressers and a TV. The living area has a very nice television to relax and enjoy some of your favorite movies. The local area is amazing with great restaurants nearby. Our favorite restaurant, the Tiki Hut, is just a 5 minute walk to the corner. They have great breakfast food including pastries for the morning routine. It’s a short walk or drive to a lot of the activities people look for. The place is great for kicking back and getting in some much needed R&R. Wave runner rentals are close, bike trails, beach volleyball, and a very nice pool are favorites. The beach is great to enjoy during the day. Pull up a chair soak up the rays, head back up to the room and enjoy the view for a quick lunch and then go enjoy the beach or activities. At night you can enjoy the sunset and have a nice relaxing evening on the balcony or go out and enjoy the town. The room now has free high speed internet! If this unit is already booked, Please see our other listing at VRBO # 691514, It is also a 2Bed/2Bath Condo. It is furnished almost exactly the same as this one. Thanks for checking our condo out and hoping you book with us. My daughter, four friends and I stayed over night to celebrate my daughters 13th birthday. The condo was a great size. privacy and perfect setting for a weekend getaway. We needed a place to stay on the beach for one night and we couldn’t have been happier. The owners were very pleasant to work with and easy to get a hold of with any questions we had. I would highly recommend. Just what a vacation is supposed to feel like! Great location, view and amenities. Owners are very responsive and great to deal with. We will book again on our next trip to the beach. Missy is awesome. Everything is as they stated. Home was clean and has everything you need to enjoy your time at the Beach. The view from Balcony is where we spent our time when not on the beach. We will be staying again in the future.